5502. Marie Clara BITLER [scrapbook] 1, 2, 3 (Winfield Allen , John Adam , Daniel F , James , John , Johannes ) was born on 5 Mar 1928 in Monro Co, MI. She died on 8 Oct 1993 in Orange Co, CA. She was buried on 15 Oct 1993 in Greenwood Cemetery, Fowlerville, Livingston Co, MI. Marie was issued a social security number . She resided in 1935 in Clare Co, MI. She resided in 1940 in Fremont Twp, Isabella Co, MI. She worked as homemaker. Marie married Dale Robert MUNRO [scrapbook] 1, 2, 3, son of Merrill William MUNRO and Mary Jeanette POLITE, on 20 Sep 1947 in Lansing, MI. Dale was born on 23 Mar 1922 in Fowlerville, Livingston Co, MI. He died on 26 Jan 1988 in Lansing General Hospital, Lansing, MI. He was buried on 29 Jan 1988 in Greenwood Cemetery, Fowlerville, Livingston Co, MI. Dale worked with Civilian Conservation Corp (reforestation) about 1939/1940 in White Cloud, MI. He served in the military with U.S. Army - Seargent in 1940 in WW II. He worked as engineer with Detroit Railway System. He served in the military with U.S. Army - Sergeant 1st Class - radioman (Army Security Agency) from 1949 to 1964 in Korea, Vietnam. + 10424 F i Kathleen Marie MUNRO. + 10425 F ii Robin Lynn MUNRO. + 10426 F iii Patricia Ann MUNRO. + 10427 F iv Sherry Dale MUNRO. 5503. 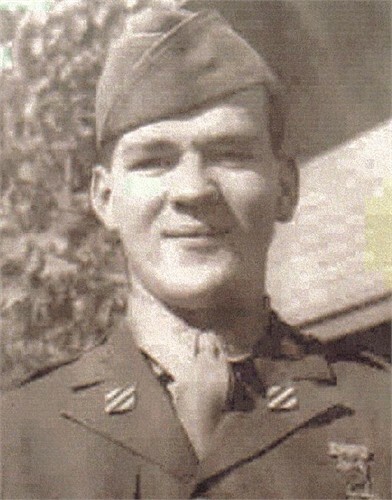 Clyde James "James" BITLER (Winfield Allen , John Adam , Daniel F , James , John , Johannes ). James married Vivian E/J BEEBE. + 10428 M i James Allen "Allen" BITLER was born on 4 Jan 1959. He died on 23 Jan 1982. James was also in a non-marital relationship with Elizabeth Mae BEEBE, daughter of Ralph BEEBE and Almira C SHELDON. Elizabeth was born on 10 Apr 1939 in Shepherd, Isabella Co, MI. She died on 17 Apr 2014 in Woodland Hospice House, Shepherd, Isabella Co, MI. She was buried on 21 Apr 2014 in Lincoln Township Cemetery, Isabella Co, MI. Elizabeth resides in 1940 in Lincoln Twp, Isabella Co, MI. She resides in Riverdale, MI. She resides in Shepherd, Isabella Co, MI. + 10429 F ii Tammy Annette BITLER. 5509. Marion A FOUST (Rosa Effiedell BLAKE , Mary Matilda BITLER , Daniel F , James , John , Johannes ) was born on 11 Nov 1897 in OH. He died on 13 Dec 1977 in Paulding Co, OH. Marion resided in 1900 in Blue Creek Twp, Paulding Co, OH. He resided in 1910 in Blue Creek Twp, Paulding Co, OH. He resided in 1920 in Blue Creek Twp, Paulding Co, OH. He worked as Laborer - Farm in 1920. He resided in 1930 in Tipton, Paulding Co, OH. He worked as Laborer - Grain Elevator in 1930. He was issued a social security number before 1951 in OH. Marion married Bernice GLASS, daughter of James GLASS, about 1923. Bernice was born about 1903 in OH. Bernice resided in 1930 in Tipton, Paulding Co, OH. Dean C FOUST was born on 15 Nov 1929 in Paulding Co, OH. He died on 28 Dec 1945 in Paulding Co, OH. Dean resided in 1930 in Tipton, Paulding Co, OH. Paul F FOUST was born on 10 Feb 1932 in Paulding Co, OH. He died on 28 Sep 1951 in Paulding Co, OH. 10432 F iii [Female] "Sissy" FOUST. Bonnie FOUST was born on 7 Nov 1928 in Paulding Co, OH. She died on 7 Nov 1928 in Paulding Co, OH. 5517. Pearl Harley FOUST (Rosa Effiedell BLAKE , Mary Matilda BITLER , Daniel F , James , John , Johannes ) was born on 24 Mar 1911 in Paulding Co, OH. He died on 22 Jul 1969 in Ft Wayne, Allen Co, IN. Pearl resided in 1920 in Blue Creek Twp, Paulding Co, OH. He served in the military with USNR in WW II. Pearl married Pauline Faye SPEAKMAN. 10434 F i Barbara Jane FOUST. Barbara married Wilmer H ROHRS. Pearl also married Phyllis B JENKINS. Phyllis was born in 1908. She died in 1943. 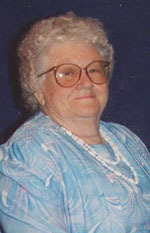 Nancy Ann FOUST was born in 1930. She died in 1930. 5521. Delmar D FOUST 1 (Rosa Effiedell BLAKE , Mary Matilda BITLER , Daniel F , James , John , Johannes ) was born on 16 Sep 1916 in OH. He died on 24 Jan 1991 in Scott, Van Wert Co, OH. Delmar resided in 1920 in Blue Creek Twp, Paulding Co, OH. He resided in 1930 in Blue Creek Twp, Paulding Co, OH. He was issued a social security number before 1951 in OH. He resided in 1991 in Scott, Van Wert Co, OH. Delmar married Mary Arlene SANDERSON "Arlene" [scrapbook] 1, daughter of Virn F SANDERSON and Bertha I HOOVER, on 1 Sep 1940. Arlene was born on 28 Dec 1921 in Paulding Co, OH. She died on 28 Apr 2003 in Van Wert Hospital, Van Wert Co, OH. She was buried in Blue Creek Cemetery, Haviland, Paulding Co, OH. Arlene worked as Dana Weatherhead in Antwerp, Paulding Co, OH. She was a member of Country Chapel United Methodist Church in Haviland, Paulding Co, OH. She was a member of Women's Society - Country Chapel U.M. Church in Haviland, Paulding Co, OH. 10436 M i Cecil R FOUST. 10437 M ii Jean W FOUST. 10438 M iii Jerry W FOUST. 10439 F iv Rosemary FOUST. 10440 F v Cheryll FOUST. Cheryll married Louis B MILLER. 5525. Goldie Mae BLAKE 1 (John Daniel Alexander BLAKE , Mary Matilda BITLER , Daniel F , James , John , Johannes ) was born on 23 Jan 1905 in IN. She died in 1934. Goldie resided in 1910 in Jackson Twp, Allen Co, IN. She resided in 1920 in Jackson Twp, Allen Co, IN. She resided in 1930 in 524 Carlton Terrace, Lansing, Ingham Co, MI. Goldie married Guy Rae THOMPSON 1, son of Joseph THOMPSON "Joe" and Maudie L RICHARDSON, about 1924. Guy was born on 19 Nov 1903 in Mt Pleasant, Isabella Co, MI. He died on 9 Oct 1983 in Manton, MI. He was buried in Mt Pleasant, Isabella Co, MI. Guy resided in 1930 in 524 Carlton Terrace, Lansing, Ingham Co, MI. He worked as Driver - Own Truck in 1930. 10441 F i Walimetta M THOMPSON. + 10442 F ii Bernetta June THOMPSON. 10443 M iii Bernard D THOMPSON. 5527. Hazel BLAKE (John Daniel Alexander BLAKE , Mary Matilda BITLER , Daniel F , James , John , Johannes ) was born on 8 Nov 1907 in Edgerten, Allen Co, IN. She died on 16 Jul 1941 in Marion, Livingston Co, MI. She was buried in Riverside Cemetery, Mount Pleasant, Isabella Co, MI. Hazel resided in 1910 in Jackson Twp, Allen Co, IN. She resided in 1920 in Jackson Twp, Allen Co, IN. Hazel married Carl RECKER on 23 Jul 1927 in Mt Pleasant Cemetery, Isabella Co, MI. Oscar V RECKER was born on 4 Apr 1929 in MI. He died on 17 May 1997. He was buried in Saint Joseph the Worker Cemetery, Beal City, Isabella Co, MI. Oscar was issued a social security number . 5537. Marie BLAKE [scrapbook] 1 (Ira James BLAKE , Mary Matilda BITLER , Daniel F , James , John , Johannes ) was born on 7 Feb 1909 in OH. She died on 1 Aug 1997. She was buried in Blue Creek Cemetery, Haviland, Paulding Co, OH. Marie resided in 1910 in Blue Creek Twp, Paulding Co, OH. She resided in 1920 in Tipton North & Sand Road, Blue Creek Twp, Paulding Co, OH. 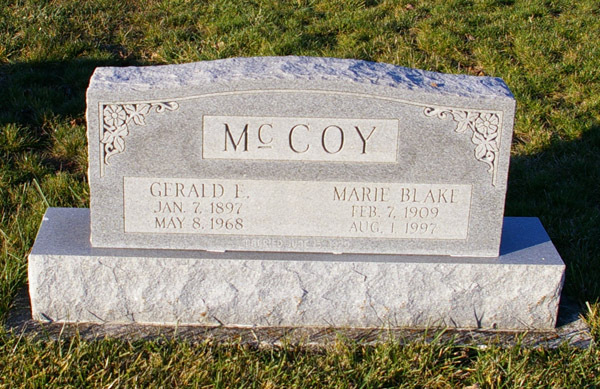 Marie married Gerald E MCCOY [scrapbook] 1. Gerald was born on 7 Jan 1897. He died on 8 May 1968. He was buried in Blue Creek Cemetery, Haviland, Paulding Co, OH. + 10445 M i Doyle E MCCOY was born on 13 Dec 1930. He died on 24 Jan 2006. 5542. Almetta "Almeda" BLAKE (Ira James BLAKE , Mary Matilda BITLER , Daniel F , James , John , Johannes ). Almeda married Calvin M COX. Almeda also married Paul W HOERNER. 5543. Ada K BLAKE (Ira James BLAKE , Mary Matilda BITLER , Daniel F , James , John , Johannes ). Ada married Leland L FISHER. 10448 M i Gary L FISHER. Gary married Carol J FREEMAN. 5544. Edna Mary Pauline MARTIN 1 (Elizabeth Angela BLAKE , Mary Matilda BITLER , Daniel F , James , John , Johannes ) was born on 28 Jan 1908 in Briceton, OH. She died on 23 May 2001 in Elyria, Lorain Co, OH. She was buried in Laporte Cemetery, Carlisle Twp, Lorain Co, OH. Edna resided in 1910 in Paulding Twp, Paulding Co, OH. She resided in 1920 in Briceton, Paulding Co, OH. Edna married Clyde Harold AMSPAUGH 1, son of John A AMSPAUGH and Della ROUSH, on 10 Oct 1926 in Payne, OH. Clyde was born on 29 Dec 1903. He died on 4 Jan 1975 in Elyria, Lorain Co, OH. He was buried in LaPorte Cemetery, Carlisle Twp, Lorain Co, OH. Clyde was issued a social security number before 1951 in OH. + 10449 F i Beatrice Elizabeth AMSPAUGH. + 10450 F ii Janice Irene AMSPAUGH. 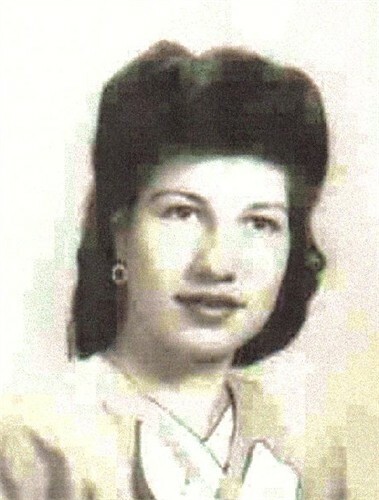 Bonnie Jean AMSPAUGH was born on 28 Jan 1930. She died on 11 Mar 1930 in Payne, OH. She was buried in Wiltsie Cemetery, Payne, Paulding Co, OH. + 10452 F iv Patricia June AMSPAUGH. + 10453 F v Emma Kathryn AMSPAUGH. + 10454 M vi John Clyde AMSPAUGH. + 10455 F vii Helen Louise AMSPAUGH. + 10456 M viii James Edward AMSPAUGH. 5545. Ida Ilo MARTIN (Elizabeth Angela BLAKE , Mary Matilda BITLER , Daniel F , James , John , Johannes ) was born on 23 Jan 1908 in Briceton, OH. She died on 2 Feb 1996 in New Haven, IN. Ida resided in 1910 in Paulding Twp, Paulding Co, OH. She resided in 1920 in Briceton, Paulding Co, OH. She resided in 1930 in Chicago Road, Latty, Paulding Co, OH. She worked as Teacher - Public School in 1930. Ida married George Kenneth ROTHENHOFER, son of Arch ROTHENHOFER and Stella GRIFFIS, on 10 Dec 1937 in Paulding Co, OH. George was born on 7 Feb 1912 in DeWitt, AR. He died on 22 May 1988 in New Haven, IN. + 10457 F i Carole Jean ROTHENHOFER. + 10458 F ii Delores May ROTHENHOFER. + 10459 M iii Larry Kenneth ROTHENHOFER.